Shots. That is all that you'll be served here. Nothing but shots to your heart's content (or eventual burn). Less of a concept bar and more of a so obvious concept drinking experience that you wonder why there aren't more of these around. By all accounts the crowd that goes here had nothing but lavish praise to heap. Shots are bought and priced by the group (singles, couples and gangs). Best of all, at the end of the bar, they have what they call a 'anti-hangover station', where they fill you up with restorative fluids to make sure you don't regret your night of partying. By Metro M1, M2, M3 line stop Piata Unirii. By Buses 104, 116, 117, 123, 124, 312, 313, 783, N102, N104, N105, N106, N107, N108, N109, N110, N111, N112, N114, N115, N116, N117, N119, N121, stop Piata Unirii. By Trams 7. 27. 32, 47 stop Piata Unirii. People normally also visit Control Club while planning their trip to Shoteria. I must say that it was a beautiful surprise! Even in such crowd, we enjoyed a lot. Totally recommend. Great place! 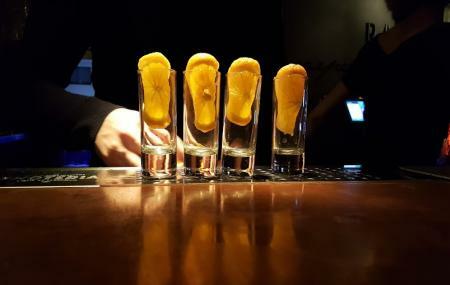 Plenty of shots, for any kind of taste.. A must go, before a night out in the Old Town clubs! It is what it says. Get in. Get some shots. The old town becomes mystical afterwards. After coming here you can truly say that you had shots!